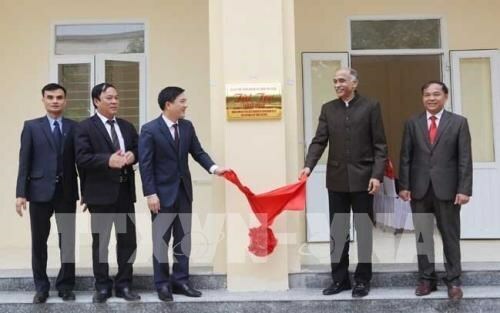 Vinh Phuc (VNA) – A canteen for Dong But kindergarten, funded by the Indian government, was inaugurated and put into use in Bo Ly commune, Tam Dao district, the northern province of Vinh Phuc, on March 22. The work was built at a cost of 50,000 USD from the Quick Impact Project Fund. Covering an area of nearly 200 sq.m, it includes one dining room, one processing room and one cooking room. Speaking at the event, Vice Chairman of the provincial People’s Committee Vu Viet Van thanked the Indian government for its support to Vinh Phuc province, especially ethnic minority people and poor localities.